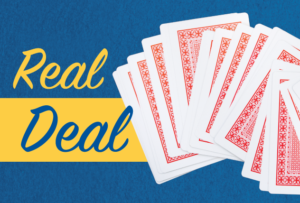 Today’s deal is from a recent tournament in Europe. North American players, typically, do not play “Support” doubles at the three level, but it worked perfectly here. 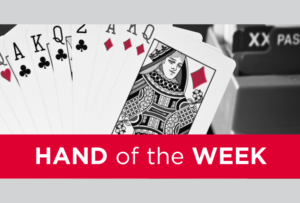 This deal shows why Key Card Blackwood has become the standard for today’s tournament players. The king of the agreed trump suit becomes a “key card,” along with the four aces. You can also find out about the queen of the agreed trump suit and side kings as well. The 5♦ response showed zero or three key cards, with spades being the “agreed” trump suit. South logically decided it was three and the 5♥ bid asked for the ♠Q. The 6♦ response promised the ♠Q, and also the ♦K. South could now count 12 top tricks. A 13th could come from the ♠J, the ♦J, or a good split of the outstanding spades. 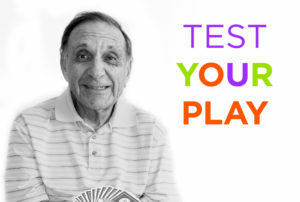 Also, why risk a bad spade split for no reason? South bid the grand slam in notrump. South won the opening heart lead with dummy’s ace, cashed the three top spades, and ran off five club tricks. West could only afford to discard one spade, so he had to discard three diamonds. South led the ♦4 to dummy’s king and led back to his ace and queen. The carefully preserved ♦ was his thirteenth trick. Well done!